When you need pie in KC | OP, The Upper Crust is your spot. Whenever you come across a business that gets nearly 5 stars on Yelp, you know you are in for a treat. The Upper Crust in Downtown Overland Park delivers just that. The smells alone are worth 5 stars in my book. We sat down with the owners and learned more about what makes The Upper Crust so special. 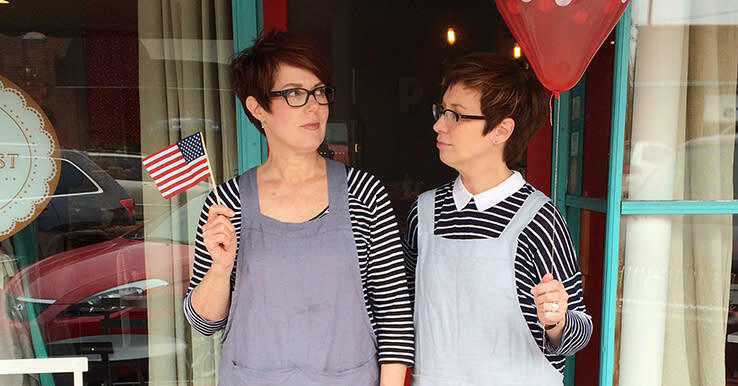 Sisters Jan and Elaine have been baking ever since they were kids. Growing up in Marion, a small town in KS, with a mother and grandmother who loved to bake, they came by it rightfully. 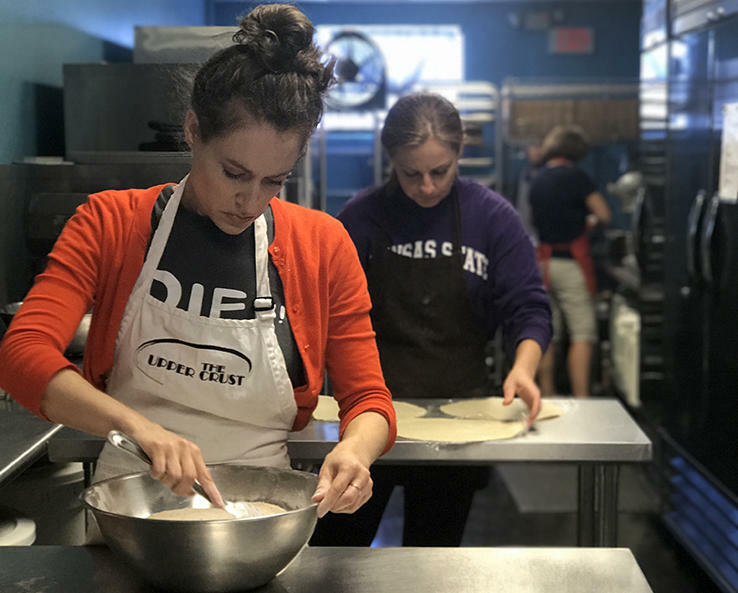 The Upper Crust started as an innocent hobby, with 100 pies made by the sisters and their mother, to be sold at the Farmer’s Market 13(ish) years ago. All the pies at this time were being made in their homes. Sidenote - being able to wake up and fall asleep to the smell of pie sounds awesome. 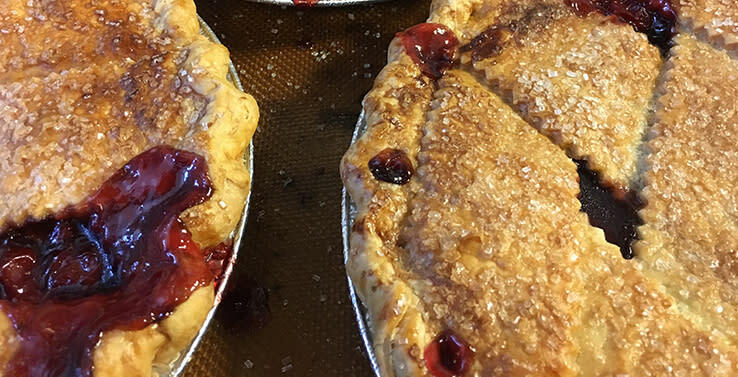 With their first Farmer’s Market going much better than planned, it was on to baking and selling their pies at Pryde’s in Westport. Lots has changed since their first weekend at the Farmer’s Market. The sisters both took a leap, quitting their full-time jobs, and turned their hobby in to a business. That has led them to where they are now, with six years under their belt in Downtown Overland Park. The best baker in the family? I had to ask because I thought I was going to stir up some family drama. But this was a pretty quick answer. Up until recently the sisters would have given the honor to their mom, but now it is a different beast when you are baking a hundred pies at a time. Jan is the winner now. The baking begins daily at 9 am, and doesn’t stop until 5 pm. During this time, they are cranking out 600-800 pies of various sizes a week. If that doesn’t sound like much, add in another 16 dozen cookies… a day. The daily output increases as the week progresses, building up to their busiest day of the week, Saturday. Don’t be surprised if there is a line out the door on any given Saturday. When baking the pies, they are using tried and true recipes. These include recipes passed down from family members, recipes from cherished cookbooks, and even from their father’s old farmer’s newspapers. The biggest tip that they have for the novice pie maker? It takes A LOT of practice, most of which comes down to the dough. Don’t over work or under work your dough. If you can find that happy medium, you will be on the fast track to a great pie. Now, let’s talk flavors. And not just what they sell. We are getting to the nitty gritty. What are THEIR favorite pies. Apparently this is like asking them who their favorite child is. We also wanted to know where the best pie they have had was from. Humbly enough, it wasn’t The Upper Crust. Their favorite slice of pie they have eaten was from Four & Twenty Blackbirds, in Brooklyn, NY. Now most importantly, if you are feeling adventurous, The Upper Crust offers…. Wait for it…. This means you can get 3 pieces of pie for $8 on the third Friday of each month from 5 pm – 8 pm. If trying 3 flavors isn’t enough, I suggest taking another friend and getting two flights to allow more taste testing. Need more things to do when you are in Downtown Overland Park? We have you covered. Check out some of my favorites, Brew Lab, Vinyl Renaissance, and the Farmer’s Market.